TechNet content on the move! 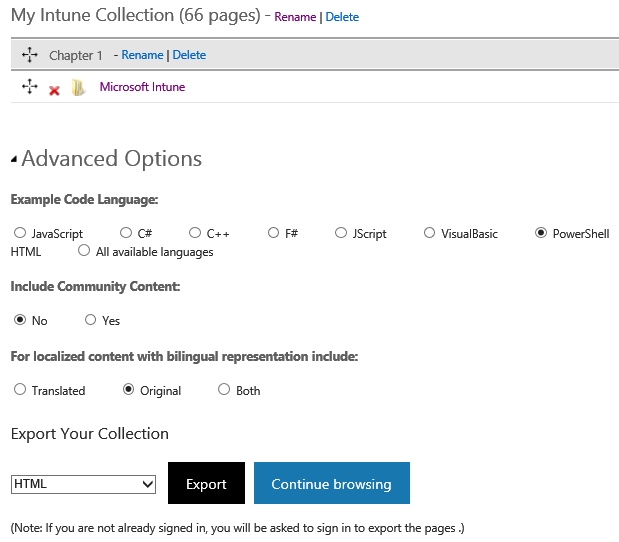 Have you noticed there is (and has been for a long time) a method to make TechNet content available offline? On the top right corner, hit Export (0). And a guide will show you how to do. Lets get started hit Start and a new toolbar will show and allow to you add the pages you’d like. When you are done, hit Manage pages in the toolbar. Select Advanced format if you rather have Example code in PowerShell (if available) and other options and hit Export. You will need to sign in with your MSA account to download the content and hit Export an extra time. Previous Previous post: Poll: Let me help you!